In the barren region around Mount Sinjar mountain in the north of Iraq, two DW reporters were able to capture the harrowing story of a Yazidi woman who survived two years in the captivity of the so-called Islamic State (IS). Opressed, Enslaved, Forgotten: Yazidi’s of Northern Iraq, brings viewers to a remote place with an intimate piece of reporting that captures how the suffering of one individual symbolizes the larger impact of genocide. The DW reporters visited the Yazidi woman and the remainder her family at the Sar-Dashte refugee camp on the plateau of Mount Sinjar and recorded their story of survival. Describing the family’s personal tragedy along with an intimate portrayal of their everyday lives and their perspective for the future provides viewers a unique experience. Although the world knows about the atrocities committed by IS, in-depth storytelling delivers a perspective that has an emotional effect on viewers. 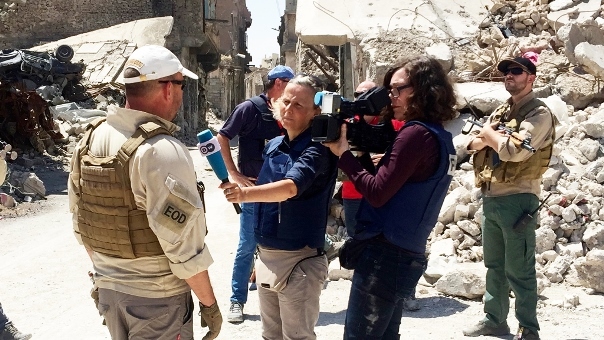 The report is a great example of the work DW’s journalists perform to share stories of forgotten people with the entire world. It will be broadcast in all four DW languages and can be seen in the DW Media Center.